I have a 1963 Sedan Deville and am trying to bring the interior to its former glory. My car interior is 'Sandalwood and I need a paint for the lighter colour on the dashboard. Can anyone suggest a decent match? Assuming your 63 SDV Trim code (see Body Plate on top LH of Cowl) is 44, your Sandalwood metal dash is the same color as the exterior Bahama Sand. My car has the Sandalwood Interior and ordered the interior paint from TCP Global and it was almost a perfect match. I took individual panels off and had my painter spray them and it matched it very close to the rest of the dash. Enter your model year and Cadillac to pull up the Auto Color Library and charts for your particular Cadillac. 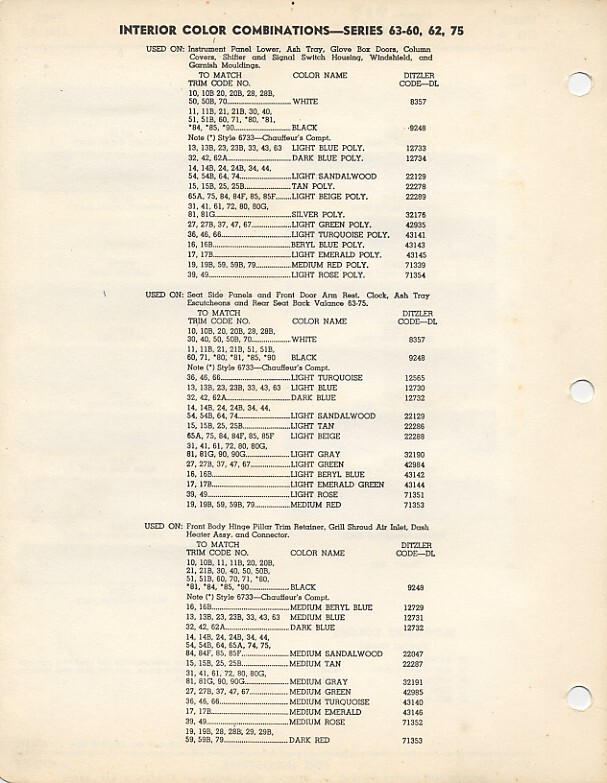 Fill in for 1963 Cadillac and see Tech Sheets at bottom and select Acrylic Enamel, enter Light Sandalwood for color, 44 for Chip Formula Number, and 22129 for Manufacturer Paint Code. Here is an example of the fill in information if I were ordering this paint ... again! Thanks for the help. The trim code on my VIN plate is 54, does that affect the colour?